Grand Avrasya Hotel which is located in the center of city makes it popular as it enables easy way of inter and intra city transport facilities. 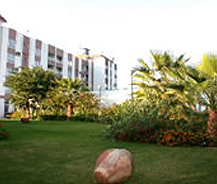 The hotel provides a safe and comfortable atmosphere with peace and greenly looks as it has pine trees over the garden. Other than this it also has a view of mountains and sea from the balcony of the hotel as it is situated in between the two. This Grand Avrasya Hotel also has an Olympic size swimming pool which makes it more popular among everyone and many guests are attracted by the same. The rooms which they contain can hold a capacity of 137 beds and each room has the facility of air conditioning, satellite TV, mini bar, bathrooms attached with shower, hair dryer, direct telephone lines for communication, and balcony which provides an extra ordinary scene to the guests. In total it has 39 rooms in that 8 are standard rooms and the remaining 31 are suites. Other than this the restaurants can hold 200 persons at a time and the pool bar can hold 80 persons. It also offers pool side entertainment by offering different types of cuisines ranging from Turkish to European. All these facilities are provided to guests to make them comfortable.